In his new role, Mr. Russo will handle day-to-day operations and collaborate with many departments to ensure that the policies, procedures and goals of the campus and College are met. He also will continue to build and strengthen the partnerships with businesses in the community that support the growth of internships, which lead to permanent career positions for Berkeley College students and graduates. 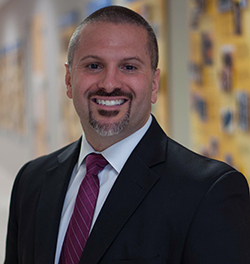 Mr. Russo most recently served as Associate Vice President of Enrollment at Berkeley College. His career at Berkeley began in 1999 as a High School Admissions Associate. Over the course of 18 years, his work in educational admissions has included positions with Katherine Gibbs, Dover Business College and Lincoln Technical Institute. He earned his B.S. in Human Ecology at Cook College, Rutgers University. To view a high resolution version of the above image, click here.